many keys at all. Its called a master key, a key configured to work with multiple doors and locks, and provide access through more then just one lock. It creates convenience and makes it easier to track accessibility of your building or home, and makes you less prone to losing a key since you only need one. The way this works is that we create the locks specifically to open for their specified key, but always this one as well. With a master key, the owner is able to distribute specific keys to specific people so that they are able to access particular areas of the property, or specific features or facilities under which they are authorized to use, but still be able to open each and every lock with his/her master key. This is ideal for business everywhere, with so many buildings, rooms, locations within your business, having a key for every specific lock would be massively inconvenient and leave much room for confusion, and a loss of keys. 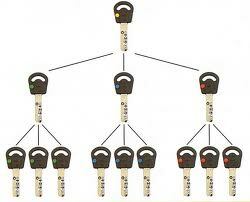 Master keys reduce the amount of keys used, and deliver the exact same result, in a more convenient way. But how is this possible, considering that each of the locks require a specific key to open it. The answer is not to key in itself, but instead the way that the lock is made. Despite what most people think, locks can be made to have two ways of opening, a specific key for each individual lock would be only one of the two, while a master key would be the second. In more extreme cases where you need even more security, there is even such a thing as a grand master key, which is used in locks which have three possible ways of being opened. Many companies have need for this extra level of security, they have more employees, supervisors and vicinities that need controlled accessibility distributed amongst many employees. There are grand master keys, master keys, and individual change keys. 24/7 Emergency Locksmith service. 15-25 minute response time from the moment your call comes through to one of our customer services representatives. We provide complete residential, commercial and automotive locksmith services.